Mr. Tiger is tired of being all prim and proper. When his behavior is deemed ‘too wild’, he leaves the city and goes into the wilderness where he can run around naked and have fun. However, he finds that it is too lonely in the wilderness and decides to return to his friends – who have been busy learning to be a little less straight-laced while he was away. I encourage parents and teachers to get a copy of this book…it’s the kind of story that will have kids saying, “Read it again, please!!! !” Available in bookstores and on Amazon. To extend the enjoyment and learning of every story time, I love to use a craft activity. Here’s a fun project using a paper plate. White or colored paper plates, brown or white paper lunch bags, a box of markers, a pair of scissors, a glue stick and some construction paper – that is all you need for hours of inexpensive, educational, self-esteem building fun with young kids! Our packing is progressing – you can finally walk into our walk-in closets! Stacks of boxes with labels line each room. I’m excited to be going to New Hampshire where I will spend many happy hours, reading and crafting and cooking with our five-year old grandson. Please come back here on Sunday…I’m part of a virtual book tour for 11-year old author Erik Weibel of This Kid Reviews Books…I’ll be reviewing his new book: The Adventures of Tomato and Pea: Book One…A Bad Idea. 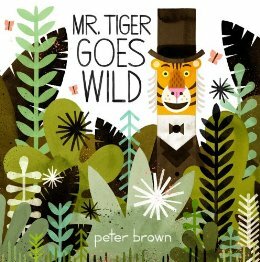 This entry was posted in Crafting with Kids, Family Activities, Perfect Picture Book Friday and tagged Caldecott Medal, Mr. Tiger Goes Wild, Paper plate tiger, Peter Brown, picture book review by viviankirkfield. Bookmark the permalink. Good luck with your move, Vivian! How amazing to meet up with everyone and see Peter Brown. I hope you do start painting. It wasn’t long ago I was in the ‘can’t’ club. I hadn’t even tried. Can’t wait to read this book it sounds hilarious! I suppose we couldn’t contain ourselves after getting the chance to meet up. Only sorry it took us so long! But we’ll ‘see’ each other most Fridays, and it looks like you’ve got a great dance partner to share the PPBF picks with! All the very best – keep dry and safe. Soon he may be reading with you – love that milestone! So happy to have PPBF back! I missed it terribly. And I Love the premise of this book! Kids will identify with MR Tiger and want to run away themselves. Any book that builds self esteem is high on my list of wanna read books. Read my Tuesday blog post for how my summer went, Vivian. I wanted to get a signed copy of a Mr. Tiger at the NJ SCBWI when Peter spoke there but I wasn’t fast enough and they were ALL gone! Lucky all of you. Oh, that’s a bummer! Maybe you can contact him and have him send you a signed one. :) He did a great art demo presentation for the kids. What a fun and bold picture book with a great message. Vivian, your tiger would make a great dot for International Dot Day, Sep 15-ish. Many KidLit bloggers will post on Sunday and next week. Hope you post it again on your blog on Dot Day as this as it is such a creative idea. Still not too late to sign up — and you don’t even have to sign. Over a 1,225,274 kids have signed up to date. Hope you participate. Great review. I like your tiger craft. Oh, thanks for sharing! We loved Peter Brown’s illustrations in Creepy Carrots so I have to check what else he’s written and/or illustrated. This one is lots of fun, Milka…not ‘dark humor’ like Creepy Carrots…great illustrations and wonderful story concepts. Isn’t it a thrill to meet the author-illustrator of a book we so admire! Love your tiger plate activity. LOVE the paper plate Tiger … intrigued by the book … wishing I’d have seen the author, too! Great review, Vivian. It sounds like a super book. I am sooooooo envious of you all, getting to meet each other, and so grateful the event wasn’t scheduled for THIS weekend. Hope you manage to stay safe and relatively dry. All the best with the move! So true…the same thing happened the weekend our daughter was here…we all went to Manitou Springs and took the Cog Railway up to the Summit of Pikes Peak…walked around quaint Manitou Springs…and the next day there was a HUGE rainstorm and the town of Manitou Springs flooded…cars were carried down the street that became a torrent of a river. You’re blessed, Vivian to meet up with the gals and of course, spend time with Mr. Brown. Life has gotten so busy with the upcoming move, Tracy, that I have not been reading or commenting on other blogs…and barely writing my own. Will be back in the swing of things by mid-October. 🙂 Glad you like the craft! 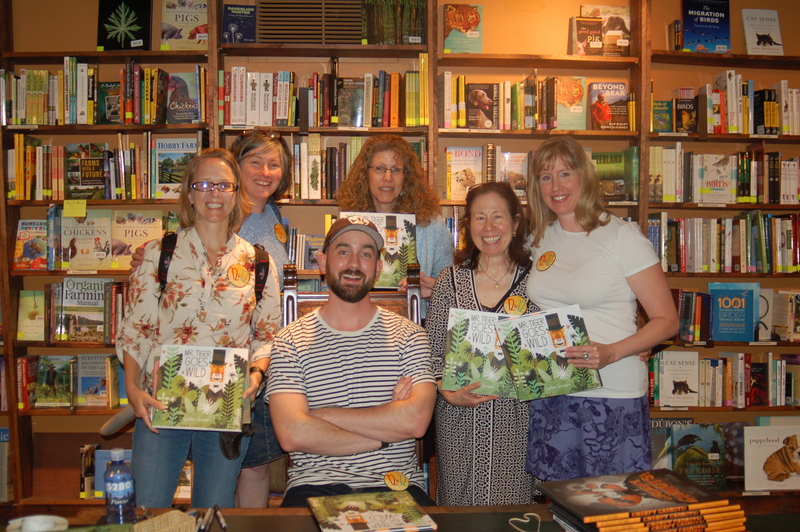 What a great picture with an all star cast from the kid lit world! That’s a great picture of all you fine ladies! What a fun time you must have had! I’m jealous that you got to meet Mr Brown! I am a big fan. i wish he would come to Texas. Thanks for the fun things to do to go with the book! Glad you liked the picture…it was such fun! The tiger paper plate craft is quick and easy…glad you liked it. Oh, Vivian – just a tiny bit envious….okay,….a LOT envious of your get-together at the book store. How fun!! This looks like a book I MUST buy…and yes you must give drawing/painting/sketching a whirl. Come over to Doodle Day for some relaxing, fun, no pressure sharing. Super fun and a great group of people, pros, amateurs and just having fun folks. https://www.facebook.com/groups/285157148286597/ This month we’re working on character drawing. Most days are just random things and you don’t even have to draw what the prompt is – just draw and doodle and share if you want.